Running brings joy to many people. But, it can also bring pain. Poor gait, muscular imbalance, repetitive stress, improper shoes, etc., can all contribute to a less than blissful experience. The constant pounding on the joints from the pavement can take its toll on the body when unmanaged. The good news is that appropriate maintenance of the body can key in to long-lasting enjoyment of this healthy exercise. There are a handful of running injuries that continue to be among the most frequent. Here, we outline the top five painful jogging issues along with one simple tool to treat and relieve them all. It’s called the Sciaticare Ball and once understood, this trigger point, acupressure and physical therapy tool can be used to relieve many body aches and pains. The importance of resolving injuries immediately cannot be understated. If one continues to push through the pain and the irritation, compound and chronic problems can arise to deter a quick recovery. Below, we will address the first of the five pain conditions that runners often suffer. The other parts will come in later segments. 1. PATELLOFEMORAL PAIN SYNDROME (Runner’s Knee, PFPS) – This has been defined as knee pain at or under the patella or knee cap. Problem — The quadriceps muscle does the bulk of the work in the upper leg during the runner’s gait. 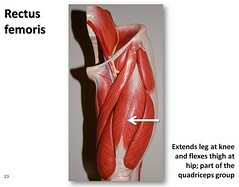 In general, the quadriceps muscle is more powerful than its antagonist, the hamstring muscle group. Due to the nature of running, this imbalance can grow out of control. The result is an overly powerful knee extension muscle group (when compared to the antagonist group). Without going into the complexities of muscle control, spasm, reciprocal inhibition, etc., the quadriceps muscle continues to pull on the knee strongly without much oppositional vector force reaction from the hamstring group. This repeated unilateral force can wreak havoc on the knee cap. Pain directly over the kneecap (or a feeling like the pain is underneath the patella) is typically due to the rectus femoris and/or vastus lateralis. Solution — This is a two-part treatment. The first part is treating the rectus femoris (RF) and underlying vastus intermedius (VI) for muscle spasm and tightness. The second part is strengthening the hamstring group. This second part is outside the scope of this article and will only be briefly touched upon in part 5 of this series. Treatment – Lie prone on a firm, flat, level surface. Find the midpoint of the line connecting the ASIS and the patella. This is the trigger point for the rectus femoris and vastus intermedius. Place the Sciaticare Ball between this location and the floor. The weight of the thigh should provide enough pressure to stimulate the trigger points found here. Reach back and grab the ankle on the same side you wish to treat, and pull the foot towards the buttock to stretch the quadriceps. Rock the leg back and forth over the tendermost areas. Treat any other tender spots nearby in similar fashion. The combined effect of stretching the quadriceps and massaging the trigger points in the quadriceps will keep muscles limber and loose. It is possible to treat the quadriceps daily, as this large muscle group can quickly adapt and benefit. Although it is possible that the runner’s knee is caused by weak quadriceps muscles, it is rarely the cause. In many cases, the quadriceps tend to be either: overpowering to the hamstrings, or inflexible. It is not recommended to increase strength training for the quadriceps group until the trigger point is worked out and the muscles made more flexible. This concludes part 1 of 5.